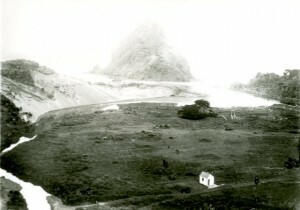 Area that became Piha Beach Domain, about 1926. Note land agent's hut at front right. In the early part of the twentieth century a Piha Domain was gazetted on what was then called the West Coast Road (now the Piha Road). Comprising 146 acres, it has now been absorbed into the Waitakere Ranges Regional Park. What is now called Piha Domain was originally called the Piha Beach Domain and comprised a number of pieces of land that were put together over time to form the final shape the Domain takes today. 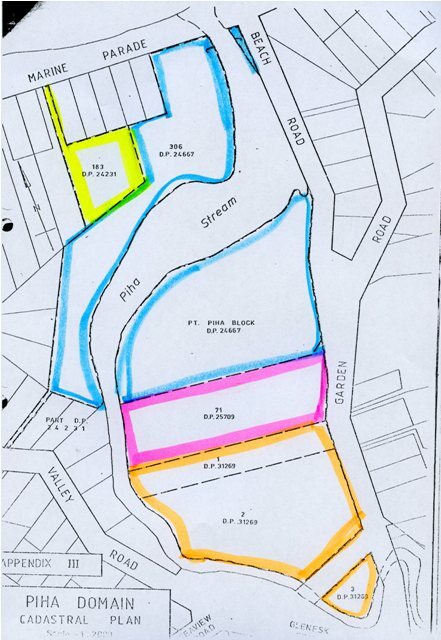 All but one were developer contributions from the subdivision of the Rayner Estate.Â See map below. Â·Â Â Â Â Â Â Â Â The first pieces were 2 hectares Â fronting the Piha Lagoon and 1.7 hectares on the western side of Piha Stream comprising the western bank of the Piha Stream and with a frontage on Marine Parade. Both these were vested in the Crown in 1933. Blue on map. Â·Â Â Â Â Â Â Â Â The second section of 1 hectare ran east of the piece fronting the lagoon and was vested in 1935. Pink on map. Â·Â Â Â Â Â Â Â Â The third section was 2 hectares east of the existing reserve and bounded by Garden Road (this part of the road is nowÂ part of Seaview Road) and the Piha Stream. It was vested in 1943 after a further subdivision by the Rayner Estate. Orange on map. Â·Â Â Â Â Â Â Â Â In 1945, at the urging of the West Coast (later Piha) Ratepayers Association, the Waitemata County Council purchased from Dr Colin Finlay a block of land with an entrance from Marine Parade that enabled better access from the Domain to the beach. The boardwalk that now leads from the beach to the bridge across Piha Stream follows the access driveway of this section. Yellow on map. Even before the land was vested as development contributions it had been run as a camping ground by the Rayner Estate. In charge of the campground was â€œFrenchyâ€, or Albert Forestier, a deserter from a French warship visiting Auckland who had initially been taken in by the Usshers and then by Mrs Ketterer. He lived in a hut in the camping ground for many years, collecting the camping fees. The Piha Beach Domain was gazetted in 1941. In December 1941 a Domain Board was formed, elected at a public meeting at Piha. It comprised Thomas Henry Pearce, Ira Nelson Elwood, Dr James Colin Finlay, Frank Harold Barnett, Edward Oâ€™Brien, Neville Claude Usher, Hayden William Edward Way, John Stanley Byers, and Charles Isaac Nathan. Mr John Melville, executor of the Rayner Estate, objected to the formation of the Domain Board as by that time the Auckland Centennial Memorial Park had been established and it was purchasing 3000 acres from the Rayner Estate. Melville argued that the Domain should be run as part of the Centennial Memorial Park, but the Commissioner of Crown Lands pointed out that the Domain wasÂ a Recreation Reserve which required a different body for governance. In 1945 the Domain Board made headlines in NZ Truth as a â€œdefaulterâ€ Â was on the Board and conscientious objectors had lost civil rights during WW2. This was John Byers who was a Quaker. The Board stood strongly behind Mr Byers who was at that time in a camp for defaulters. In 1948, the name was simplified to Piha Domain, the â€œPiha Domainâ€ on Piha Road having been incorporated into the Centennial Memorial Park. Some time in the 1940s, the area that is now Tasman Lookout was added to the Piha Domain but in 1963 it was given to the Auckland Centennial Memorial Park as it had proved too costly to maintain. In 1967, the Board said the running of the Domain was outstripping its ability to raise finances and its Domain status was withdrawn and it was deemed to be a Recreation Reserve and was vested in Waitemata County Council.